Today's referral process makes it difficult for patients to get the care they need. Of the one third of patients that receive a referral, 20% to 40% do not follow through. There are also additional challenges such as the lack of communication between providers, long appointment lead times as well as selecting the incorrect provider for a referral. As financial risk continues to shift to providers they will need better ways to actively manage referrals on behalf of their patients. A solution is needed that eliminates today's challenges, makes it more convenient for patients and providers, and provides end-to-end visibility across the care continuum. 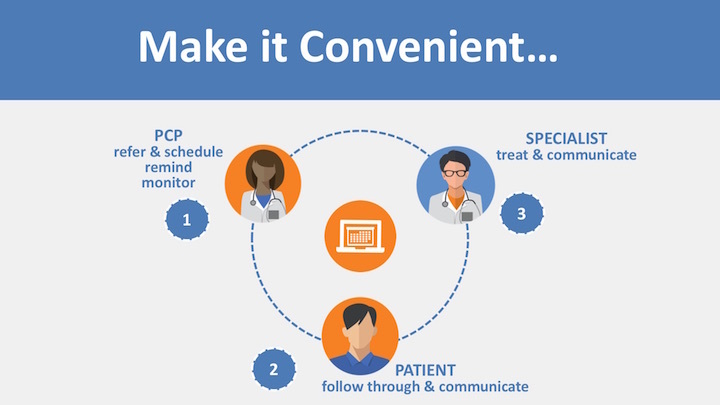 The provider creates the referral in her EMR and verbally gives cardiologist recommendations to the patient. The PCP may obtain authorization from the insurance company or leave it to the patient and/or the cardiologist. The patient leaves the PCP office with complicated instructions and a recommended cardiologist. The patient may conduct their own research and ultimately selects a cardiologist. The patient calls the selected cardiologist and may have several back and forth interactions before confirming an appointment. The patient has spent at least one hour trying to coordinate all of these activities. The patient completes the appointment with the cardiologist. The cardiologist initiates new orders for the patient and the referral is complete. 1. Inability to manage across the entire process: each step happens in a silo across disparate systems. There is no ability to manage or have visibility across the entire process. For example, the referring provider has no idea if his patient showed up, which specialist the patient saw or how far away the appointment is. Research has demonstrated that 25% - 50% of referring providers do not know if their patients completed the referral. 2. Inconvenience makes it difficult to follow through: patients are left on their own to select a specialist, make sure records are exchanged and actually schedule the referral appointment. In most other industries, similar activities would happen instantly online. In this instance, patients may spend hours coordinating all of these activities. 61% of patients would switch providers if it were more convenient to schedule an appointment. 3. Limited provider communication: Both the referring and receiving provider may not communicate. Studies show that around 50% of providers do not have contact with one another. 4. Patient/Provider mismatch: the specialist can often receive patients that aren't qualified or suitable for their expertise. 5. Inability to proactively change behaviors: providers and patients do not have the visibility or solutions to change behaviors as the process is unfolding. For example, if a patient ultimately schedules an appointment several months from the referral date, the provider does not have the ability to intervene or propose earlier availability with different specialists that provide similar services. 1. Making referrals more convenient: the referral and appointment must take place together when the referral is identified and key activities should be consolidated. The referring provider and patient should partner together to find the right provider and confirm the right appointment. Making it more convenient to access referral care will increase referral completion rates. 2. Sharing information across constituents: by providing clear information on condition, quality data, network preferred and availability, providers can avoid unsuitable patients and unnecessary referrals. Additionally, providers should have the ability to share notes and other relevant information such as if the patient attended. 3. Using data to change behavior: with a consolidated view of all referral activities, interventions can be made to reduce appointment lead times, change referral patterns and increase availability. 4. Proactively engaging patients: referring providers should have capabilities and opportunities to re-engage those patients that did not follow through. With a consolidated process and platform, providers and payers will have the ability to proactively intervene as needed. Additionally, by making it more convenient to manage referrals there is a 5X increase in completion rates and a 25% increase in referral capture. By decreasing lead times 36% through the use of data-driven insights, show rates increase 20% for appointments that happen within 7 days of the referral. ACOs and networks will gravitate towards solutions that are more convenient, data driven and integrated across systems to improve quality and increase financial reward. And most importantly, patients will be more likely to follow through on the care they need.